The vertical discharge design is a nice complement to our FRS series. 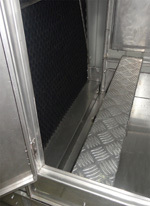 They can be arranged on site flexibly to meet various heat rejection requirements. Either stainless steel or galvanized steel framework can assure reliable tower body and prolonged durability. Fillers are vacuum formed of 0.4mm (1/64”) thick PVC film. Filler sheets configuration incorporates sloped flutes in both air intake and outlet sections and are high efficient wet deck media. 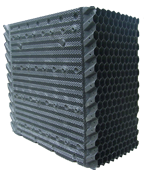 The honeycomb shaped air intake louver section contributes minimum resistance to airflow and prevents ingress of foreign matters. The sloped flutes in the outlet section of filler sheets act as the primary drift eliminators to reduce droplets escaping through the exhaust air stream. Primary drift eliminat or ensures drift loss less than 0.005% of circulating water flow. The wet deck media with continuous triangular pattern is specially designed to provide maximum air/water contact and lower resistance ensuring high efficient heat transfer. Drift loss less than 0.001% of circulating water flow rate can be achieved by equipping the drift eliminator. Taking advantage of the sophisticated experience that RYOWO cherishes in transmission system design, both gear drive and belt drive are available upon request. Airfoil-shaped hollow blade fans are made from Aluminum extrusion alloy. Fan hubs are fabricated from hot-dip galvanized (HDG) circular plate with epoxy coated cast iron core and Aluminum blade camps. The fan blades are adjustable in pitch to allow for maximum utilization of rated horsepower and optimum performance. High efficient lower tip speed and light weight design ensure low power consumption and low noise level, thus and guarantee 100% performance. FVS series extends the gene originated from cross flow cooling towers, that is, easy to implement the maintenance work.